A one size fits all benefits programme doesn’t work. Tarun Gulrajani also emphasises that you can’t just implement another organisation’s best practice to your own organisation and expect it to work. Instead, you have to really look at your business and what they need. 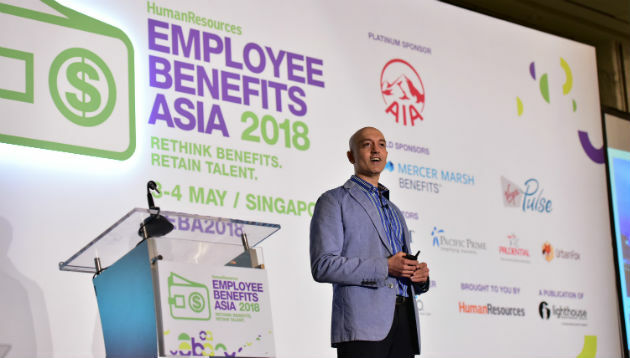 Presently the head of human resources for APAC at REHAU, Tarun Gulrajani was the keynote speaker at Employee Benefits Asia 2018, Singapore edition held on 3-4 May 2018. These changes, especially the tech revolution are happening at the speed of light. “Every aspect of our lives is being disrupted or at the verge of disruption. Yes, the a big threat to every company is losing people. But, the bigger threat is change. Companies that fail to change, whether it’s products or how people are managed internally have suffered,” Gulrajani explained. Companies have to be flexible, and that also sets the tone for how HR needs to be flexible to help the business. As a furniture company, Gulrajani’s previous company struggled to attract people and retain them. As a company with a sound compensation model that is competitively benchmarked, money becomes less of a motivating factor. Hence, Gulrajani proposed an overhaul of the company’s wellbeing programme. There is this misconception that wellness programs has to do only with health. But it’s not only that. A wellbeing programme doesn’t stop at giving everyone a Fitbit and letting them exercise. The euphoria of that will wear off and the situation will revert to how it was. The first step involved conducting a wellbeing survey to find out exactly what employees wanted. “The survey emphasised that one size doesn’t fit all. For a Millennial, insurance policies and health benefits may be the last thing on their mind. “They want to go on a holiday, learn a new language, and go to the gym. And in the same line, if you give a zumba class to employees aged 45 and above, they will be think ‘are you kidding me?’. After analysing the survey, looking at what employees want and balancing that with what makes sense for the business, Gulrajani and his team segmented their wellness benefits into four key themes – health, social, educational, professional – with all themes customised for different segments. This started out on a small scale – in one country first. Then the team looked at what worked and what doesn’t, and depending on the feedback and success rate, they rolled it out in other countries. Learn to fail fast. That is what i learnt when I was working in IT, and that is what I preach to my HR colleagues. The entire project took two years to complete. And when it comes to the returns on investment, Gulrajani believes ‘everything in HR can be measured’. So, for this programme, they measured attrition, engagement, and take up rate. With that, Gulrajani concluded his presentation with some key learning points. Employee wellbeing is more than just a health thingy, it’s much more than that. Determine what works for your company. For example, in some countries surveys don’t work. So do a workshop. You can’t just send an email to employees and think HR’s work is done. Start small. You don’t have to change everything at once. Use your employees as your ambassadors. This knowledge was shared at the Human Resources’ conference, Employee Benefits Asia 2018, Singapore. To know more and attend more such events, please visit: http://www.humanresourcesonline.net/events/.